If you want character driven, try Anita Shreve. Not Alone, by Craig A. Falconer. Different type of alien contact book. It is about how the world would react to the discovery of alien artifacts and how the gov't. covers up the find. [....] Please be sure to let us know which of the many suggestions in this thread you enjoyed. I always appreciate the recommendations of others, and it will also help us to narrow down the list for you! Thank you, I will. This turned out to be a very helpful thread for me, and hopefully for others, too. I am about halfway through Pillars of the Earth, by Ken Follett, which was the first recommendation in the thread (REWahoo) and a book you recommended as well. I like it quite a lot, so far. I was a bit intimidated by the size of the thing (900+ pages) and assumed I was in for a 100+ page warm-up. But no, he gets rolling right away and keeps things moving. I like his writing style. It is clear and crisp, without a lot of ostentation or superfluous verbiage. The characters are well drawn and believable. The time period is interesting. I haven't read many books set in the Middle Ages. I feel like I'm being entertained and also learning some things. I've gotten emotional a couple of times, so I know I'm connected with the characters. Based on what I've read so far, I plan on reading more of Follett's stuff in the future. I hadn't read any prior to this. I've got a long list of titles to investigate, based on this thread. I'll try to provide feedback as I make my way through them. I appreciate the suggestions. I've googled the subject before ("best novels" and whatnot), but for some reason have never gotten very good results that way. How bout a collection of short stories? Tons of them at the library. I've noticed that the editor of the collection makes a big difference in whether or not I enjoy the stories. One editor has selected a bunch of boring, uninteresting (to me) stories and another has selected stories almost all of which I like. Currently reading a collection edited by Joyce Carol Oates, which I like. Finished Pillars of the Earth (Follette) today. Really powerful book, enjoyed every bit of it. I was very impressed by his writing, his command of all that varied material, his ability to hold my attention for 970 pages, and to bring all those characters to life. I want to sample other writers first, but I definitely look forward to reading his Century trilogy and other works. John, that's a good idea. There are some excellent short stories out there (although it also seems to be a "dying form," in a way, probably because it doesn't pay as well as a novel). As you say, the anthologies can be a bit of a crap shoot. I am gravitating to novels at the moment, because they allow you to sink into the world and the characters more than a short story, which tends to be more of a snapshot. Still, I've enjoyed short stories in the past, so it's something to keep my mind open to. Updating, for anyone who gives a poot. Tried a few crime fiction novelists -- Larsson, Paterson, Ellroy, Nebso. All of them seemed to be good writers, but I'll have to leave this genre for later. My issue is that it focuses on the worst elements of humanity, and so it usually amplifies my cynical or mistrustful attitudes. I polished off a novel in this genre not long ago, so I'll have to wait for a while before I do another. Tried a few science fiction novels -- Three Body Problem, Old Man's War, Illium. I didn't take to the first or third, but I enjoyed the second one. It was a light, entertaining read. The military SF stuff isn't really my style, but I needed something simple after the epic tome of Pillars of the Earth. As far as fantasy, I tried Bujold but didn't like her writing style, seemed too affected, and the story focused too much on politics and royalty for my tastes. I sampled a little of Robin Hobb (Ship of Magic) and liked that better. It's on my shelf, waiting for the right time. Ah, Lonesome Dove. I'm only 50 pages in or so, but I'm really liking it so far. I love the atmosphere and the characters, especially the main ones. McMurtry can really turn a phrase sometimes, and some of the lines are laugh out loud funny. I've never read a western before (well, not since Shane in college), but I may read more in this genre, if I continue to enjoy this one. It kind of surprised me, because I never thought I'd like a western. I think I had a prejudice against it, thought of it as redneck or something. But there's something here I like. Never read the book, but Lonesome Dove is a classic TV series! I wasn't in the mood at the time to watch the whole thing, but I saw half an hour of it, enough to remember Robert Duvall and Tommy Lee Jones. I picture them now whenever I read about Augustus and Call. That's some good casting. I'll have to watch that series, once I finish the book. I am reading Slash and Burn by Colin Cotterill. This book is the further adventures of Dr. Siri Paiboun, the Laotian national coroner. In this book he sets out with a group of American searching for the remains of a helicopter pilot who crashed in Laos on an 'aid' mission during the Vietnam War. The character of Siri is remarkable. Forced to work as the National Coroner (Pension? What pension? That was promised to you by the old royalist regime.) Siri can't help but look into things that embarrass the people in power. He is not the low energy, easy to control old guy they think he is. Rather he is a cantankerous old man who is nobody's fool. And he knows where a lot of skeletons are buried. The books are a delight to read and you don't need to know much about Laotian culture and customs to enjoy them. After I finish a book I fill out a one sentence description for my records. 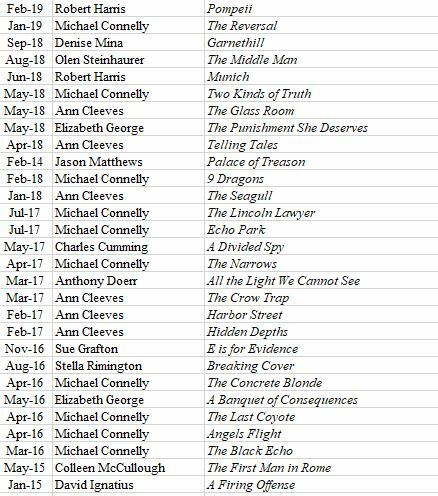 Below is a list of books I've read in recent years that I really liked. I did not include the description sentence here because it might give away the plot. I read about 2 books a month. Usually fiction. Yes, you will find a fair amount of dark crime fiction below. But that is a great genre for exploring the eccentricities of characters. And that is the interesting part ... the weirdness of humans. The books I showed on this list I had personally rated at "5". I've read several other Steinhauerer Steinhaurerer Steinxxxxx Steinhauer books that I rated somewhere between 3 and 5. I find that if you like an author, then Wikipedia is a good way to see the author's other books in the sequence they were written in. I mentioned that because it's so easy to do, and I hate it when I plug stuff in incorrectly on a spreadsheet. I also like to visit each author's homepage. If you know the name of an author you like, you can enter his/her name on this website and it will list other authors who have a similar style/genre. The closer two authors are, the more likely the reader will enjoy the new author. I recently finished the book Crazy Rich Asians, which I picked up from the local library after watching the movie. The movie was fun but kind of shallow; I much preferred the book. What's it like to straddle East vs. West and Crazy Rich vs. American Middle Class? The book makes a valiant attempt to describe this situation. Robert Jordan has a big series, The Wheel of Time. Reading that series will hold you for a few months.